If you have been looking at various online poker sites to find the best promotions for the World Series of Poker Main Event, you can stop looking now. Americas Cardroom trumps them all. The site has simultaneously launched four special promotions that will reward hundreds of players with “packages” worth $12,500 towards a Las Vegas adventure. The packages consist of cash being paid into each winner´s account – $10,000 for the WSOP Main Event entry and $2,500 towards travel and accommodation costs. Americas Cardroom has guaranteed that all winning players who request the withdrawal of their winnings by Bitcoin will have the funds in their Bitcoin wallets within 24 hours. The first promotion out of the blocks is a WSOP Main Event Steps program. This promotion consists of a series of eight full-ring Sit & Go games with ascending buy-ins. Players can buy-in directly to any Step (the lowest entry point is just $0.25 + $0.03) and work their way up to the top Step. At the top Step, the first AND second players will both win a $12,500 WSOP ME package. To ensure there is plenty of action at the top levels, Americas Cardroom is giving away Step 4 tickets as prizes in the site´s Sit & Crush leaderboard competition. As a further encouragement to participate in the higher levels, players who reach Step 6 are being given the option to opt out of the Step program and use their Step 6 ticket to enter a WSOP Main Event Mega-Satellite on Sunday July 2nd. The WSOP Main Event Mega-Satellite gets underway at 3:00pm on Sunday July 2nd. It has a buy-in of $500.00 + $40.00 and guarantees a minimum of fifty $12,500 “packages”. AS well as players being able to exchange their Step 6 tickets for an entry in the Mega-Satellite, Americas Cardroom will be hosting a comprehensive satellite schedule into the event starting at Freebuy level. If you are unfamiliar with Freebuy events, these are tournaments that cost nothing to enter, but that have re-buys available throughout the late registration period and a significant add-on thereafter. Most Freebuy events start with players being short-stacked (typically 500 chips and blinds of 15/30), so players willing to invest a little in their skills will likely have an advantage over freerolling players. Like most online poker sites, Americas Cardroom has a three-handed hyper-turbo Sit & Go game in which a random prize pool is announced at the start of each game. 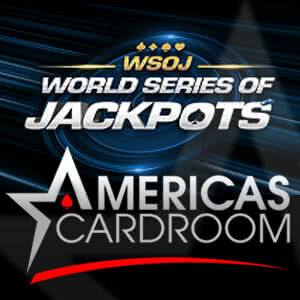 At Americas Cardroom it is called Jackpot Poker. Therefore it makes sense that, if you are going to include a package to the World Series of Poker among the possible prizes, you call your promotion the World Series of Jackpots. 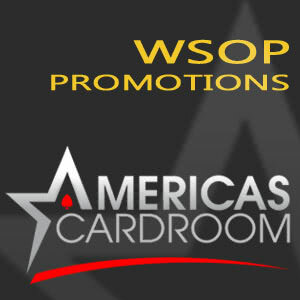 However, rather than give away one package to the winner of a game when the Jackpot prize is drawn, Americas Cardroom is giving away packages to all three players seated at the table. This promotion has been incredibly popular over the past couple of years due to its low buy-ins of $3.00 and $30.00 – the difference in buy-in representative of how often the Jackpot prize is drawn. 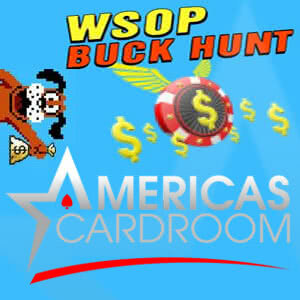 The WSOP Buck Hunt promotion is one for cash game players. At variable times of the day throughout June, Americas Cardroom will release flying chips at randomly selected 6-Max and full ring cash tables. Each chip has a random prize value from $0.10 up to a $12,500 WSOP ME package, and the player who reacts quickest and clicks on the flying chip will win the cash prize straight away. The value of the prizes – and the frequency of the top prize – increase according to the stakes of the table. For example, players at a $0.01/$0.02 table will see a Jackpot chip once in 100,000 times, whereas players in a $0.50/$1.00 cash game will see a Jackpot chip once in 7,000 times. At the higher stakes tables, the minimum prize value also increases up to $2.00. The Prizes Are There to be Won. Will You be There? Between the four promotions, Americas Cardroom is likely to pay out more than $1 million in WSOP Main Event packages. Compared with other online poker sites offering WSOP promotions, Americas Cardroom pretty much dwarfs them all! 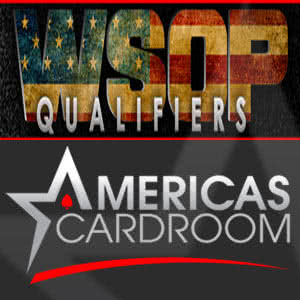 If you want to win a seat in the WSOP Main Event, there´s only one place to play – visit Americas Cardroom today!